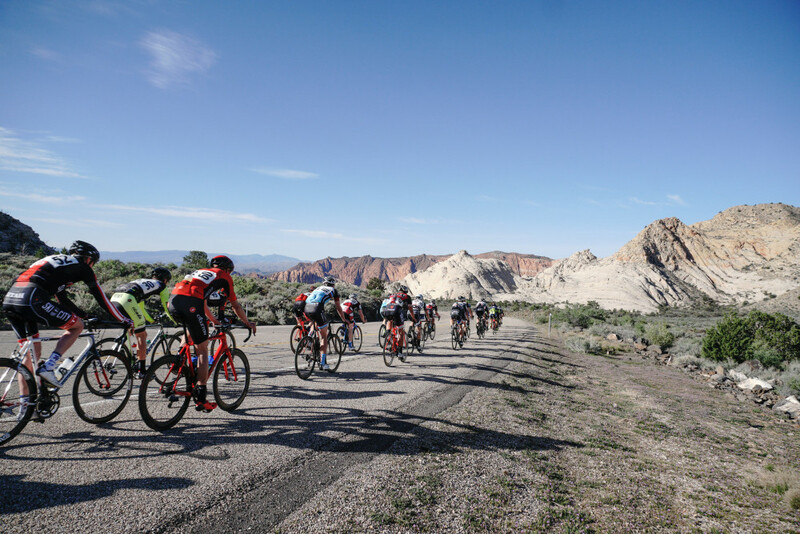 ST. GEORGE — The jaw-dropping beauty of Southern Utah’s diverse landscapes will be on full display as hundreds of cyclists travel throughout Washington County during the “Spring Tour de St. George” Saturday. The event starts at 8 a.m., beginning and ending at Town Square Park, 50 S. Main St., St. George. Starting in downtown, the route immediately climbs toward the red rocks and skirts the base of the Red Cliffs Desert Reserve as riders head toward Red Mountain and pass by the mouth of Snow Canyon State Park. Later, riders pedal south to the Arizona state line before heading toward Sand Hollow and Quail Creek State Parks and their respective reservoirs. From there, participants glide into St. George through more layers of sandstone. The race ends at Town Square Park with plenty of green grass and trees. There are three distances – 35, 75 and 100 miles. All of the distances will have fully stocked rest stops. The 35-mile route has an elevation swing of a little more than 1,400 feet, while the 75- and 100-mile distances contain elevation swings of about 4,000 and 5,500 feet, respectively. Dye said he is expecting approximately 600 competitors to participate, representing an increase of about 50 riders from 2016. An estimated 85 percent of the participants will be out-of-town guests. The Tour de St. George is in its 14th year and occurs twice per year – in the spring and fall. There will be no road closures for this event, Dye said, but road signage will be placed to alert motorists that cyclists will be on the road. Motorists and cyclists are encouraged to be courteous and use extra caution when sharing the road. Online registration is closed but riders can still register at packet pickup located at Red Rock Bicycle, 446 W. 100 South, St. George, on Friday from 1-7 p.m. and also on the morning of the ride at Town Square Park from 6:30-7:30 a.m. Registration varies depending on distance and is between $40-$80. There is no price increase for late registration, Dye said. More information about the Spring Tour de St. George including course maps and elevation details can be found online. What: Spring Tour de St. George. When: Saturday, Aprill 8, 8 a.m.
Where: Begins and ends at Town Square Park, 50 S. Main St., St. George. Additional information: Online registration is closed but riders can still register at packet pickup located at Red Rock Bicycle, 446 W. 100 South, St. George, Friday from 1-7 p.m. and also on the morning of the ride at Town Square Park from 6:30-7:30 a.m.
Hey this is great, it’s what is done in St George. I am curious why when there was 700 participates for a shooting event at the Southern Utah Sports Shooting Park last weekend there was not one mention before, during or after the event. My only hope is that the county has planned to run a street sweeper along the shoulders of the roads used in each of the loops. The skinny tires, running at 100 psi, do not handle the accumulated junk that well. BTW – Memo to the lycra-clad riders, please take your damaged tubes home with you. Discarded bicycle tubes litter the shoulders of several of these stretches of highway, especially Highway 7…..
Wanna a crying towel ? Memo to Yoga Pant-clad drivers in their cars: please pick up your trash, beer cans, Starbucks cups, etc… it very unsightly as I ride around the area on my bike.